29 March 2016, at 6:00a.m. Treena Hein talks to poultry experts about new systems that provide feed and water to newly hatched chicks. In a conventional hatchery, chicks receive no food and water on hatching, but access their first nutrition after being shipped to the broiler farm a day later. There has been some industry buzz recently about hatchery systems that provide immediate access to food and water upon hatching, but does this arrangement actually improve bird performance, health and welfare? Doug Korver is among those scientists who answers yes to that query. He believes immediate feeding increases early intestinal development and potentially reduces stress and susceptibility to disease, whilst also increasing early growth rate. Professor Todd Applegate, who heads the Department of Poultry Science at the University of Georgia in Athens, Georgia, US, agrees. “We did a study a few years back with turkey poults to this end,” he said. “In our study, the biggest thing we found was long-term effects on intestinal cell life… In the ‘delayed placement’ treatment (48 hours of feed and water withholding), there were more intestinal cells undergoing programmed cell death and not as many cells actively dividing – ultimately affecting intestinal villus length. There were similar effects on body weights during first 4 days.” This study appeared in the journal Poultry Science in 2005. Two years earlier, Maiorka et al. published similar findings on chickens in the Journal of Applied Poultry Research. Elijah Kiarie also agrees that immediate feeding of chicks boosts their early intestinal development and growth rate, while potentially reduces stress and susceptibility to disease. “The immediate post-hatch period is critical for intestinal morphological development in order to digest feed and assimilate nutrients,” stated the assistant professor and holder of the McIntosh Family Professorship in Poultry Nutrition in the Department of Animal Biosciences at the University of Guelph in Guelph, Ontario, Canada. 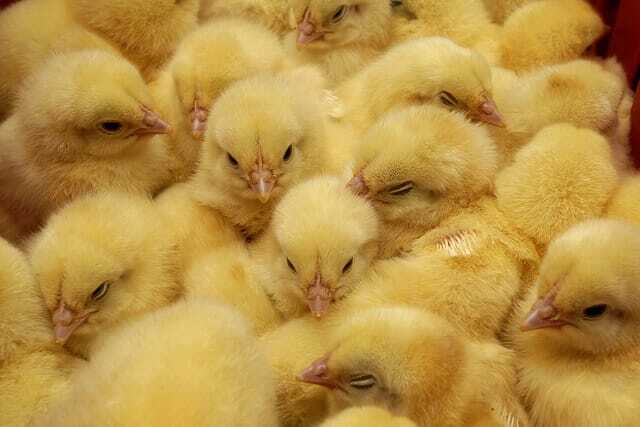 “Extensive research has shown that chicks fasted for up to 48 hours post-hatch had poor gut health and function compared to chicks presented to feed upon hatching. “This indicates a preferential intestinal growth immediately post-hatch and the sooner the gastrointestinal tract achieves functional capacity, the more quickly the chick can utilise dietary nutrients and replenish its depleted energy status efficiently – thus achieving genetic growth potential, while resisting infectious and metabolic diseases. ‘HatchCare’ incubation and chick care system is one system now available which allows newly-hatched chicks to immediately access water and feed. HatchCare was introduced by HatchTech of the Netherlands in 2014 after about six years of development. The total number of chicks being reared under the system annually across the world is now over 700 million. Hatcheries with HatchCare systems are located in Australia, China, some European and South American countries, the US and Canada (the company cannot be more specific at this time). Synergy Agri Group in Port Williams, Nova Scotia, Canada was the first Canadian company to install HatchCare. It did so in late 2015, and now produces about 200,000 HatchCare chicks per week. With its recent installations, Probroed & Sloot in the Netherlands is now running ten HatchCare systems, with production of HatchCare chicks topping 900,000 per week. Probroed and Sloot’s Edwin Paardekooper said their HatchCare chicks are about 15 per cent heavier at poult compared to chicks they rear without the system. Mr Korver isn’t sure whether any scientists have looked at the behaviour or welfare implications of giving chicks immediate versus delayed access to feed and water. The HatchCare system also involves a chick handling system called HatchTraveller, where the chicks stay in small individual crates from hatching through delivery to the farm with uniform conditions in terms of temperature, air flow and relative humidity. The crates are cleaned and disinfected for re-use. This article originally appeared in the March 2016 'Feeding and Nutrition' issue of our digital magazine ThePoultrySite Digital. To read more articles from the issue and sign up to receive the next one, click here.